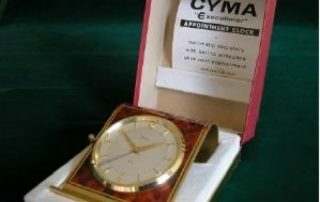 Cyma’s Executimer is an 8 day desk clock with a variable duration alarm. It has a 15 jewel 22 ligne (49.6mm) Cal.8-15 movement with the alarm work mounted on the backplate of the movement. This is similar to Cyma’s S18PN. This example is unusual as it is in a condition seldom seen for a clock of its age (1960s) and its horizontal configuration which exposes it to dust etc. It comes in its original box with instructions.